It was freezing cold in the Dacia. But looking up at the inverted sky, showing through the condensation-laden rear glass, we could tell one thing – it was going to be a nice day. 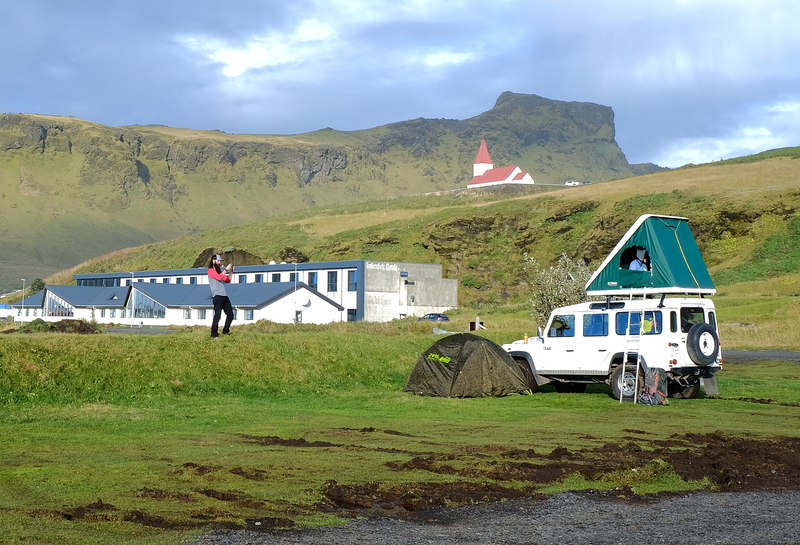 The Vik campsite where we had spent the night had turned out to be in quite the scenic location. The ocean was right across the way and a picturesque church adorned the hills nearby. It was only slightly disturbed by the presence of three American-Pie-type characters emerging from their sleeping quarters and raising the ruckus nearby: As we were wrapping up breakfast, we surveyed our first objective – the scenic hills nearby. Impressive enough from where we already stood in the valley below, we knew they would offer an even better view of the surroundings from their elevation. The Duster-shuffle was performed once again, with all supplies and luggage packed and relegated to the back, and we were off once again. 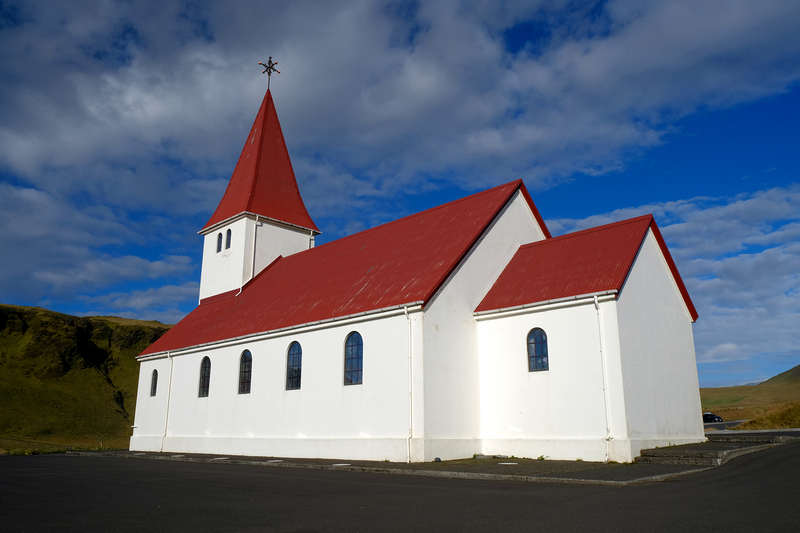 The first stop was only five minutes away: Surprisingly, the Vik i Myrdal Church lot was fully vacant and no tourists were in sight. We were grateful, since this allowed us to take unobstructed (for once) shots of the building. 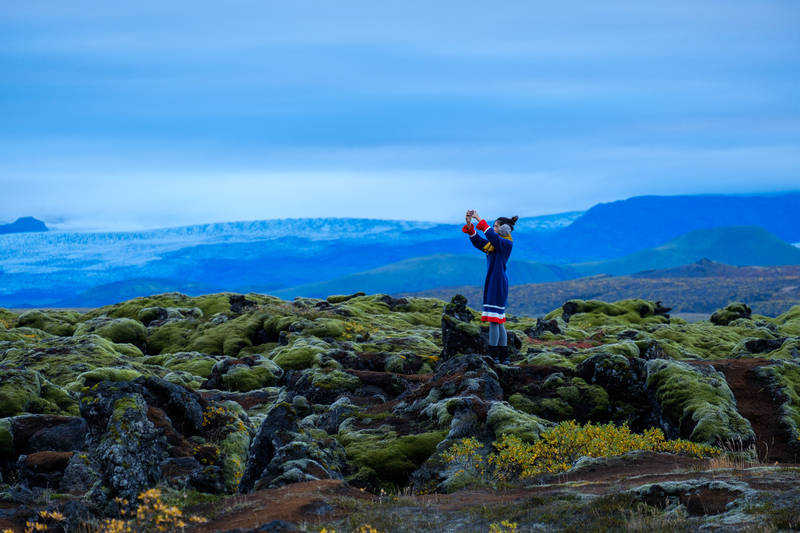 The town of Vik stood right below with the famous trio of basalt rocks showing in the distance: A glacier also lurked nearby, its outline blending with the clear sky: As it goes, however, it wasn’t long before the crowds showed up and the selfie sticks began to glimmer in the Icelandic sun. It was time to move on. 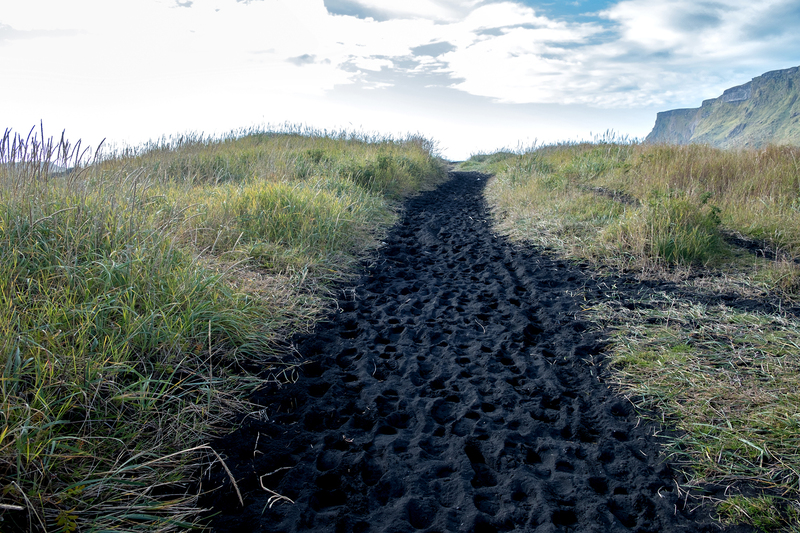 Dismounting the hill, we next headed to the black Reynisfjara beach of Vik, located almost directly underneath. 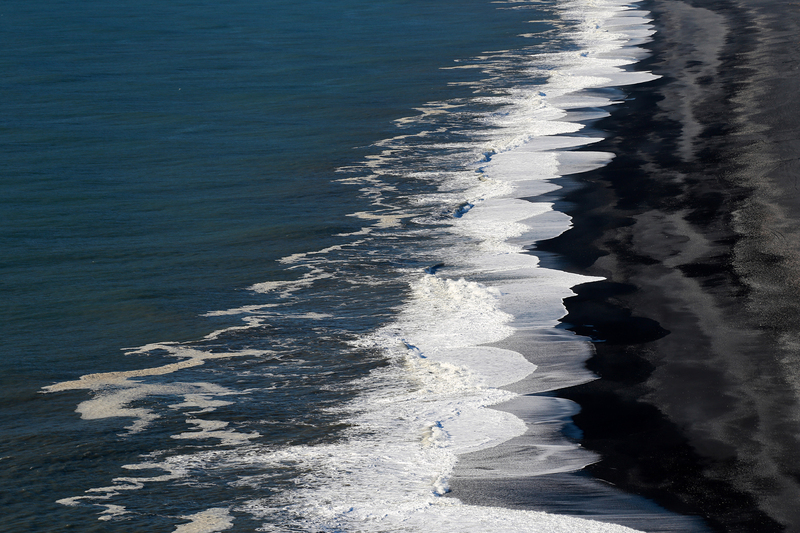 As the name suggests, its sands are a somewhat unusual color, having been formed from volcanic rock: A bulldozer working on a jetty completed the already otherworldly combination of dark sands and raging Atlantic waves. 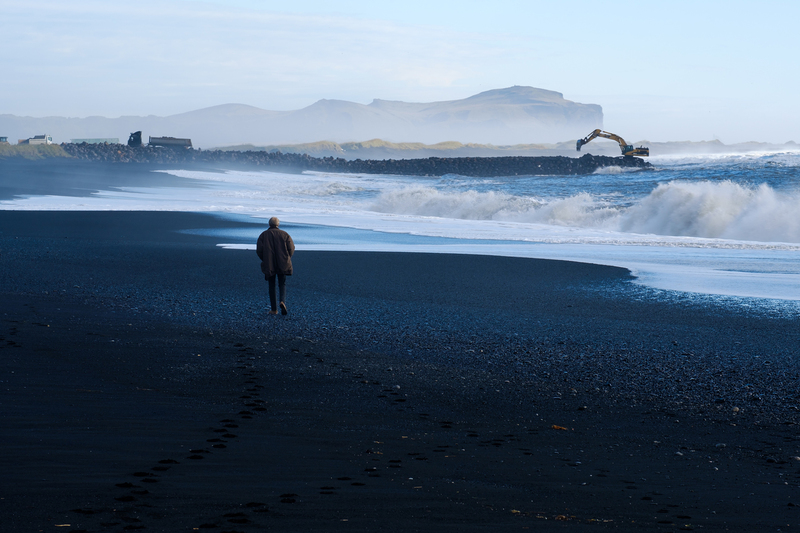 Epic photographic moments ensued: From the beach, we were able to get a better look at the famous Reynisdrangar rock gathering offshore: Having exhausted this particular portion of the dark-hued beach, we looked to our notes. 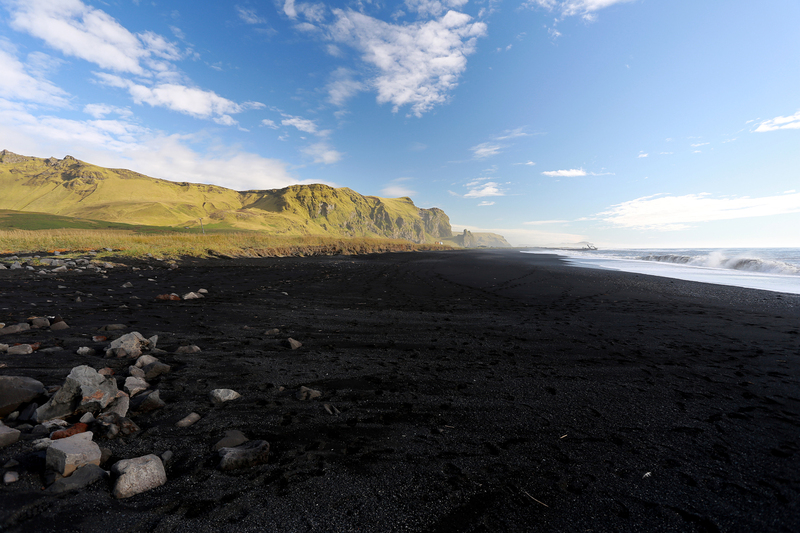 They reminded us that the black sands of Vik are host to another visually fascinating rock formation quite nearby. 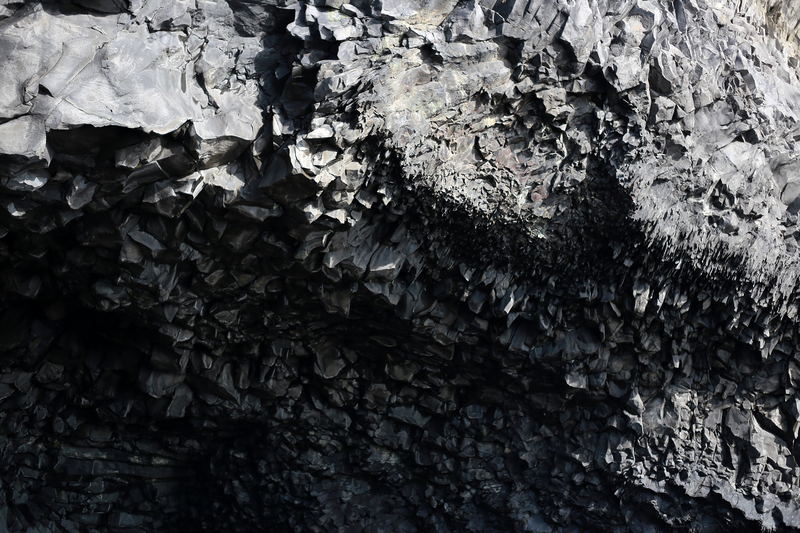 The square-ish basalt columns of Reynisfjara had looked fascinating in the pictures we had seen online prior to arriving, and we were eager to explore the photographic opportunities they presented. Onward and (hopefully) upward. 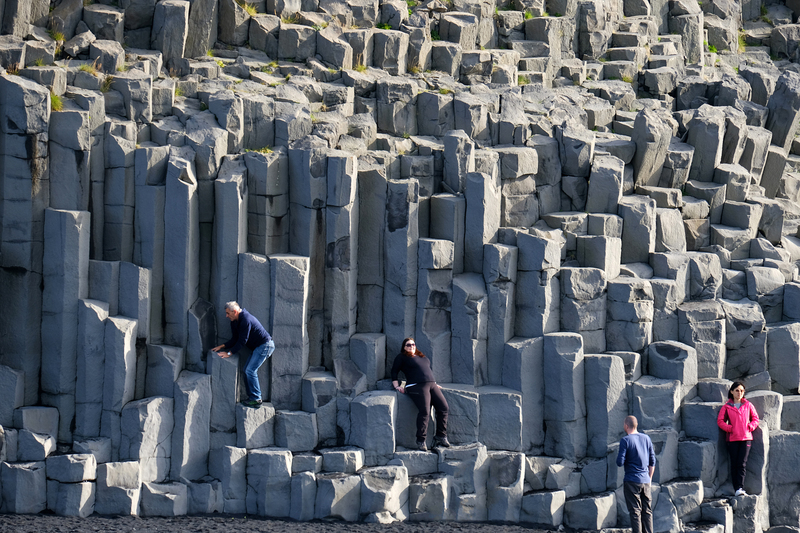 We arrived to find the tourists doing this to the rocks: Different angles were tried. Futile attempts at isolating the inanimate from the human were perpetrated. To no avail. The hordes were just too much: Amidst the ubiquity of the human invasion, one of the best attempts at capturing the nature we came to see was this shot that Nikolay managed to get of the cool-looking cave right next to the columns (I guess they haven’t figured out how to get to the roof…yet): Salvation, if you could call it that, was found in a capturing a photogenic rock formation of curious shape, resting in the waters nearby: We were starting to get the idea and lower our expectations accordingly. 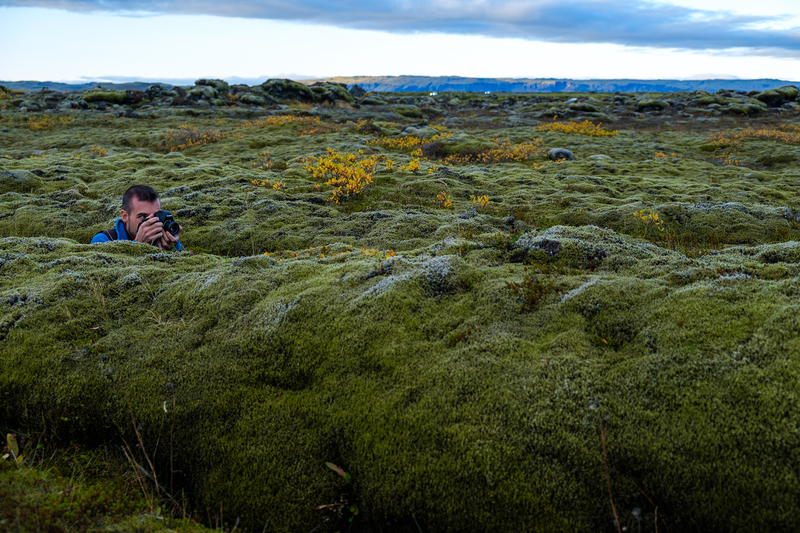 A positive outlook and one-pointed concentration on the objects of our photographic interest would be key to a successful tour through Southern Iceland’s most picturesque prospects. But, hey, the weather was good and enthusiasm was in the air! 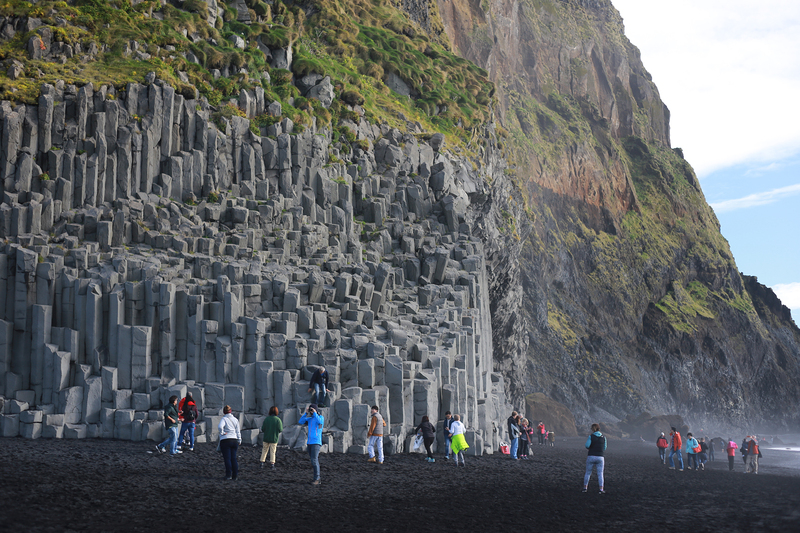 : We continued on to Dyrhólaey. What is Dyrhólaey you ask? 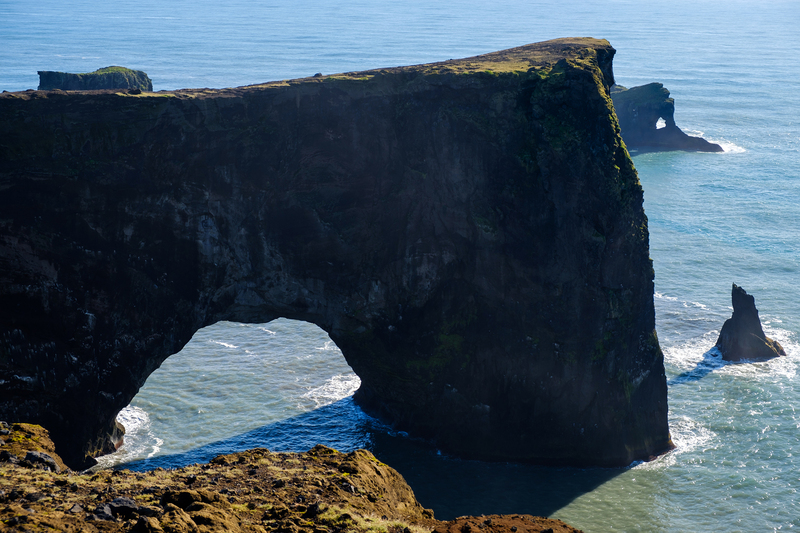 The name itself translates to “door hole”, describing a gigantic now-solidified lava arch that protrudes from the shore. 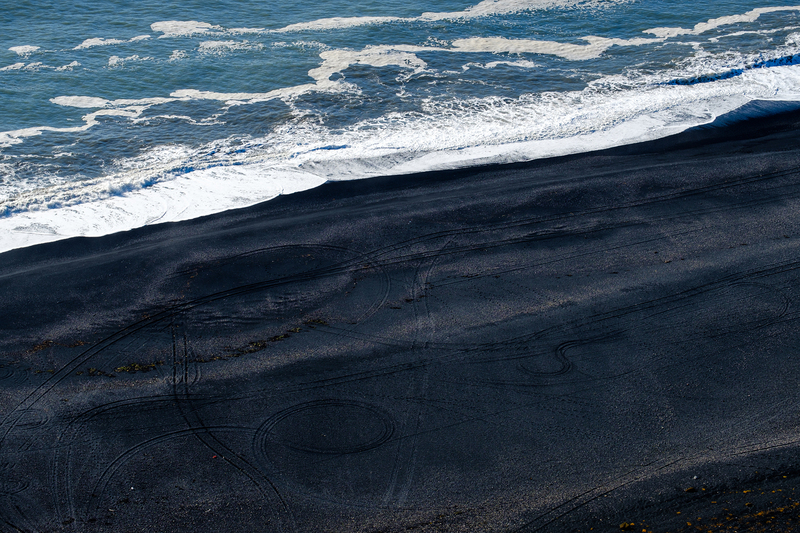 The peninsula and the adjacent beach (populated with black-colored sand, as well) were also of particular interest to us. 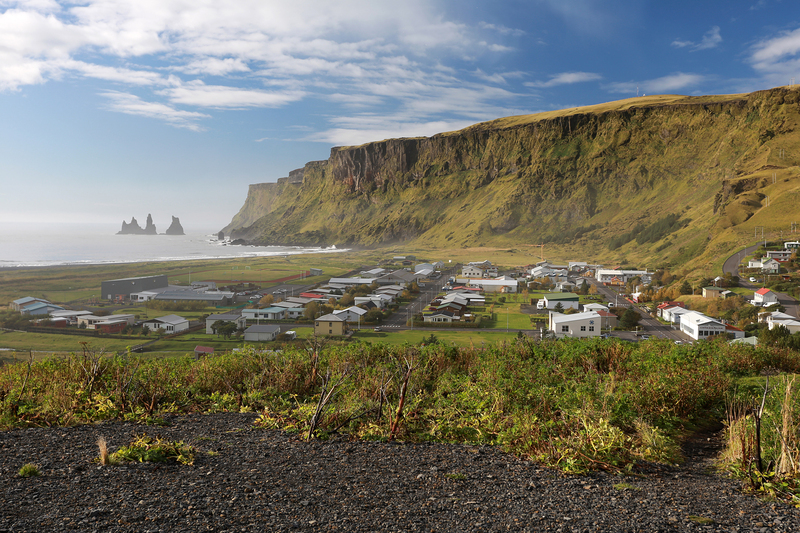 To reach Dyrhólaey, we had to head east, away from the town of Vik, passing through some beautiful scenery and a multitude of colors and textures that now stood out clearly in the perfect weather. 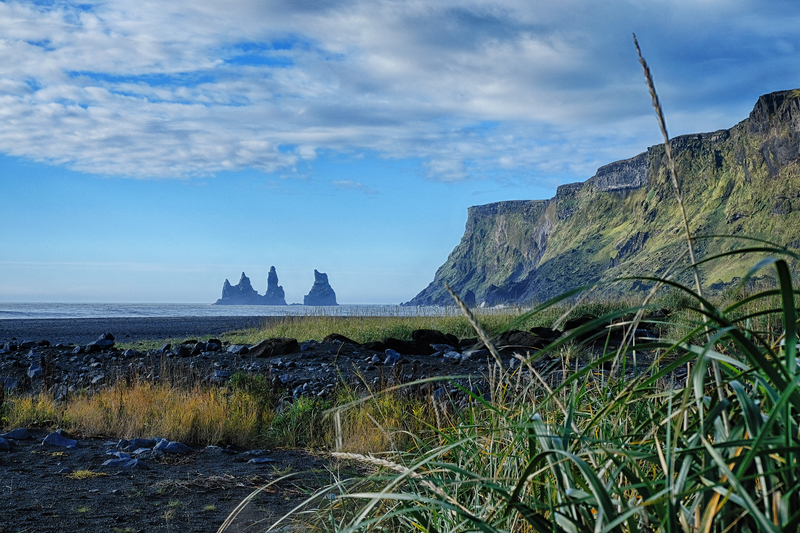 The commute in Iceland is often as scenic as the destinations themselves! 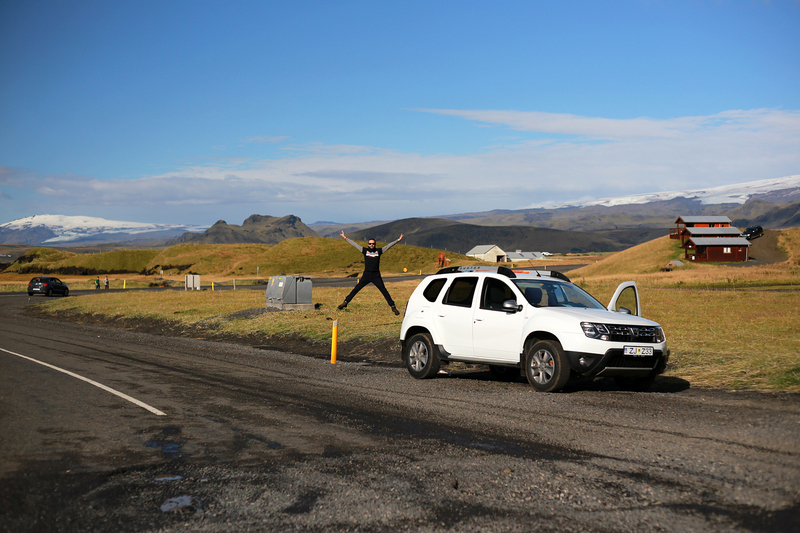 It was an uphill climb to the Dyrhólaey vista point, and we were, once again, grateful for our Dacia, which scaled the somewhat rough and narrow road without as much as a strain. 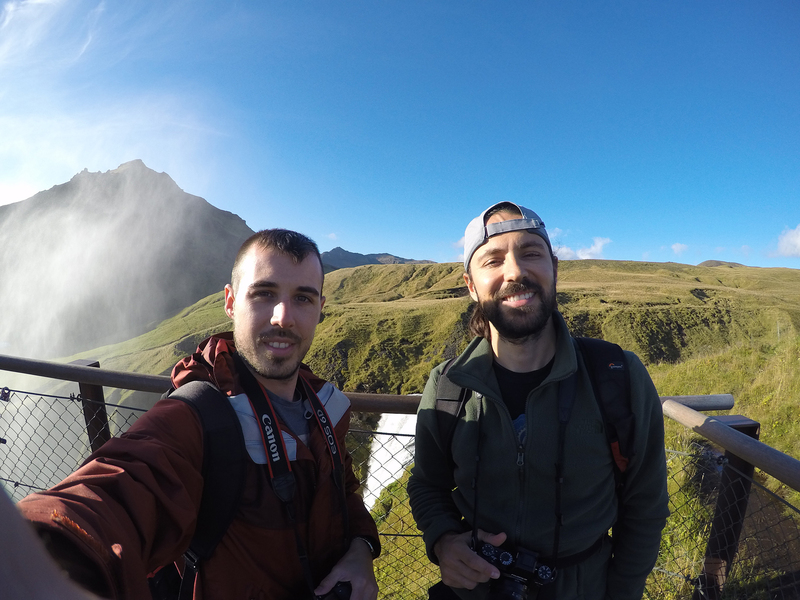 Once at the top and parked, we began to take in the scenery all around. 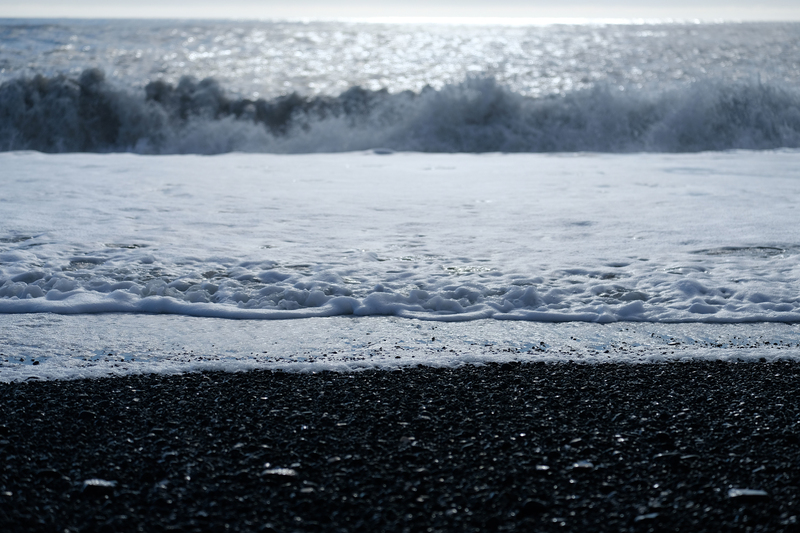 It was truly breathtaking: No matter which direction you turned, landscapes of epic proportions laid themselves out before your sight: The tire-marked black sands below formed an awesome display of contrast with the whitecaps: Even the manmade structures were eye-catching and well-placed. Truly a photographer’s paradise! 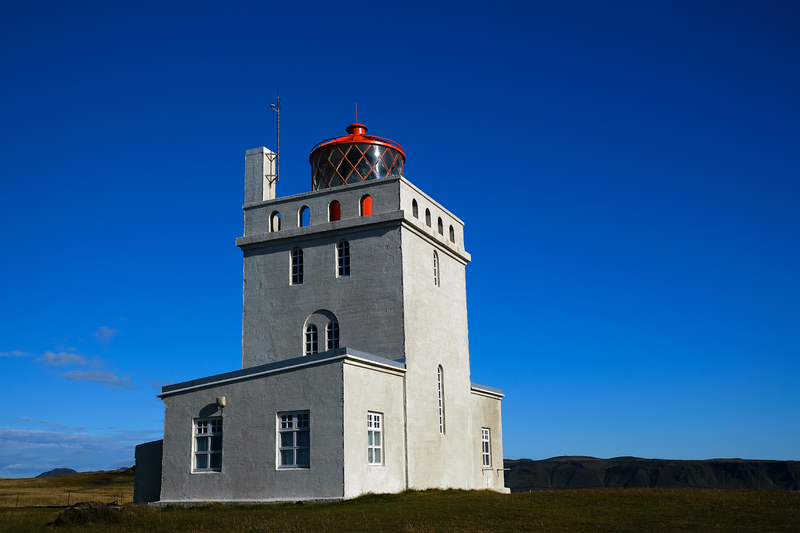 : There’s a cool-looking lighthouse, too: What about Dyrhólaey, though? Where was the famous namesake of the place, the proverbial door hole? It revealed itself soon enough, though I have to admit, I personally found the peninsula, the beach and the general surroundings far more interesting. 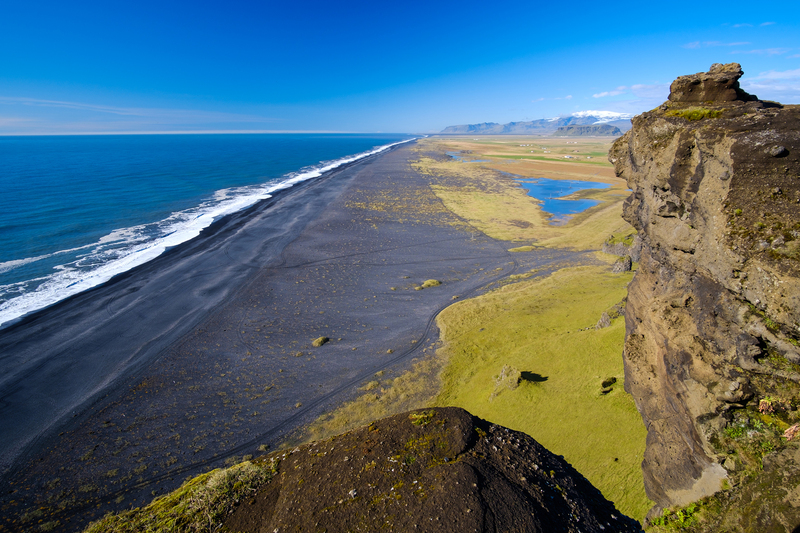 Nevertheless, we checked that one off the list, as well: The walking path around the not-so-large peninsula forms a semi-circle that meanders somewhat near the edge of the cliffs. 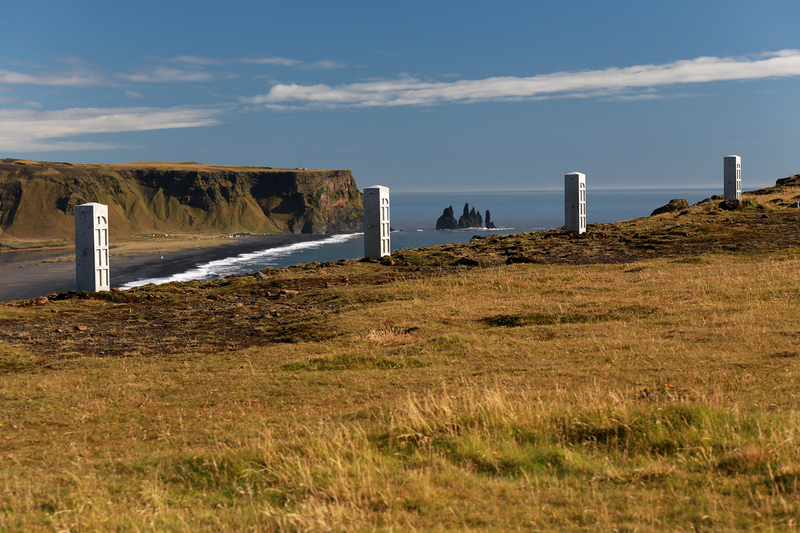 We had made our way toward the Dyrhólaey overlook and the lighthouse on one side and were now circling back on the other, walking toward the parking lot. 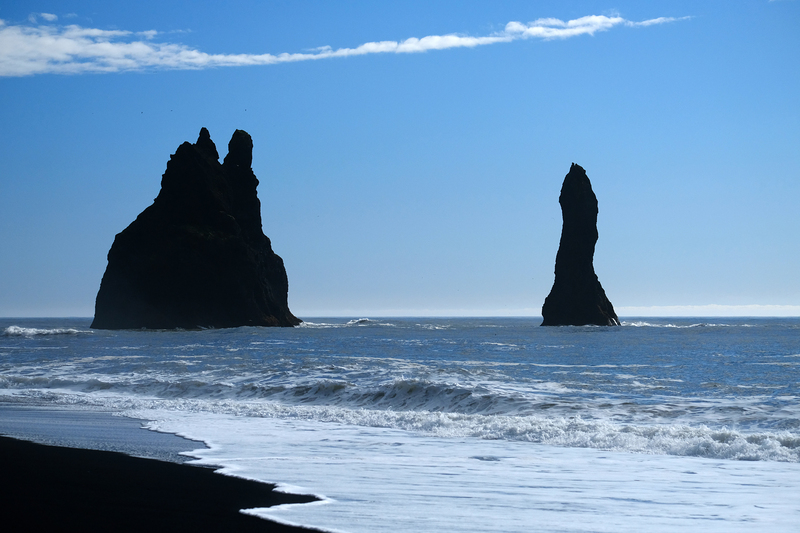 Once again the black sand beach came into view on our left, and we just couldn’t take our eyes (and lenses) off the grandeur: We really didn’t want to leave Dyrhólaey. But our reluctance had to be overcome, and for a very practical reason, too. Yours truly had (right around the time of that joyful jumping picture a bit further back in our tale) relegated two fairly important personal items to the roof of the Duster to dry in the surprisingly persistent sun. 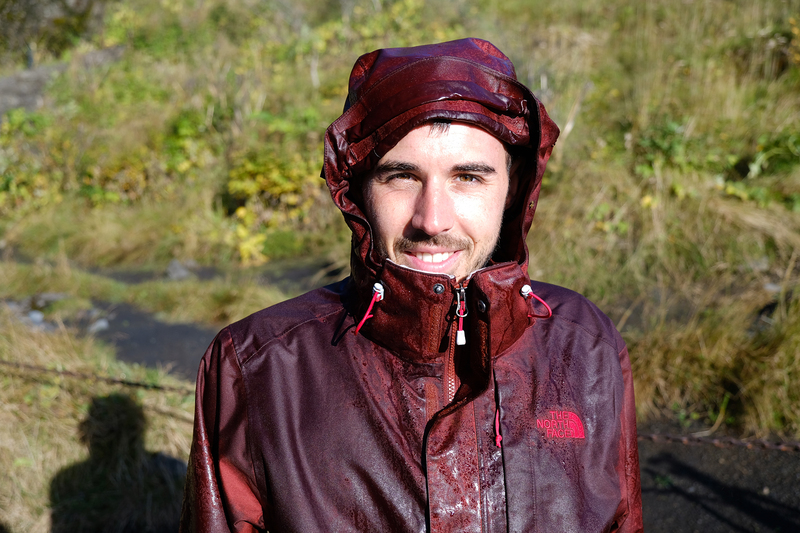 Every piece of gear is always wet in autumnal Iceland…and you must use whatever means of drying you have (A/C anyone?). All well and good, except I had completely forgotten to place said items back in the vehicle before departing. The next best thing to buying a new pair of swimming trunks (for the hotpots, remember!) and towel in expensive-beyond-belief Iceland is backtracking on expensive Icelandic fuel to one’s previous destination and finding the old ones. Not exactly clean or dry, and hanging on the handle of a dumpster, but who’s minding the details. 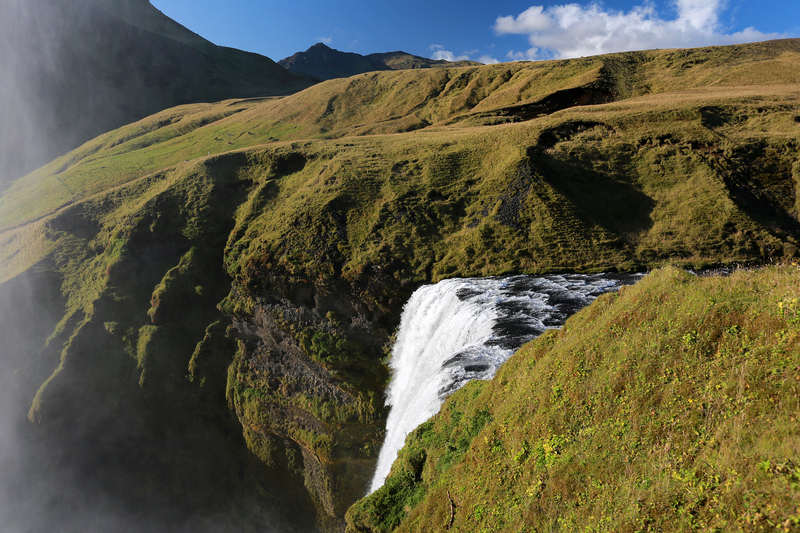 Toward Skógafoss – our next point of interest for the day – since we weren’t yet tired of waterfalls. We pointed the Dacia further West, backtracking a little bit more. 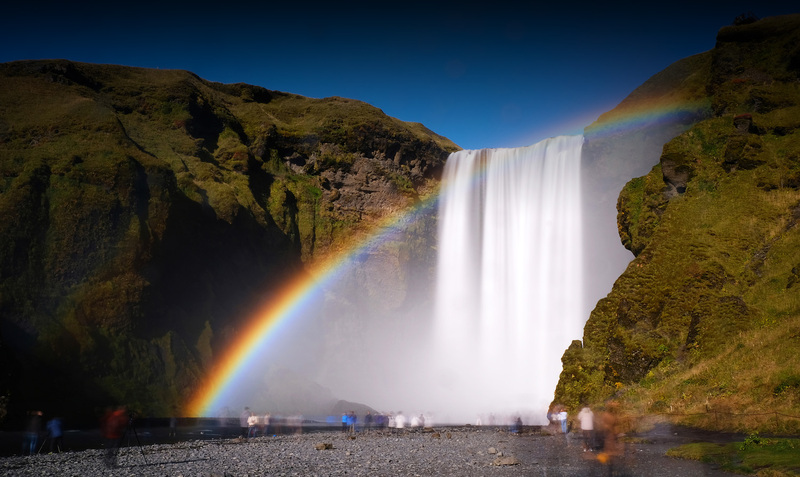 And before you know it, the congestion of the falls’ parking lot emerged from the Icelandic landscape. It was still a nice day. 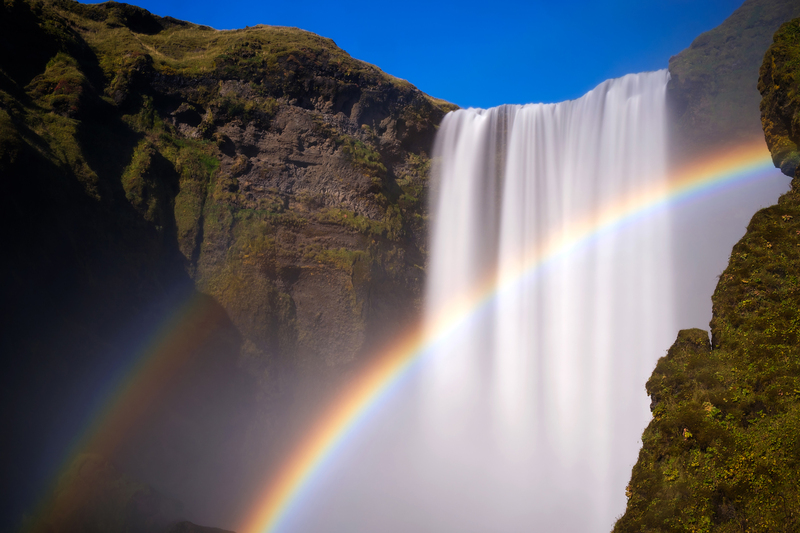 Skógafoss is one of the bigger waterfalls in South Iceland, and it is somewhat unique in that you can view the grandeur of its spillage from ground level, as well as from a viewing area on a terrace above the dropoff. 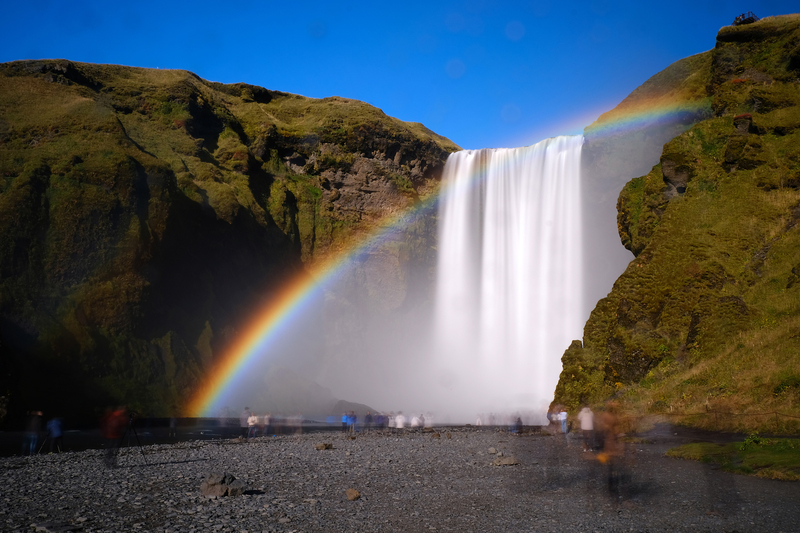 As with the other locations, it was fairly crowded with people, so any photographic attempts that required an uninhibited view would have to be accomplished through the optical miracle of the ND filter. Well, attempted anyway… We unfolded tripods and started shooting away. 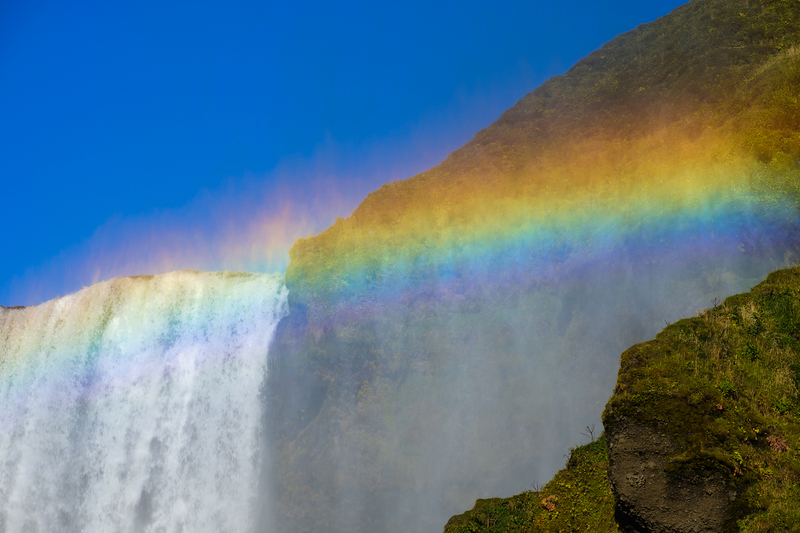 Thus having more or less explored all the possibilities the wonder of Skógafoss had on display, and seeing that daylight was nearing the end of its span, we descended the stairs and packed ourselves into the trusty Duster once more. It was getting dark and we needed to start heading toward our camping destination for the night. 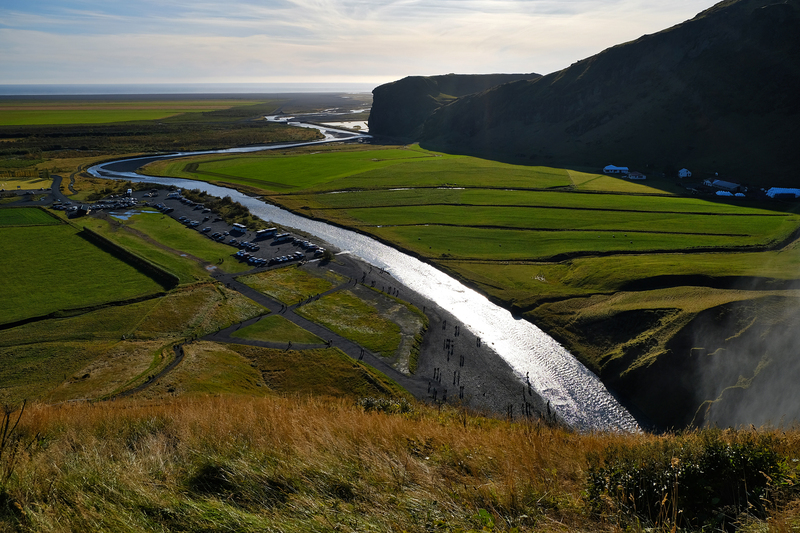 We hadn’t specified a definite place as our goal, but had marked down a number of campsites east of Vik, on the way to our ultimate endpoint, to be reached in a few days – Höfn and the East Icelandic coast. 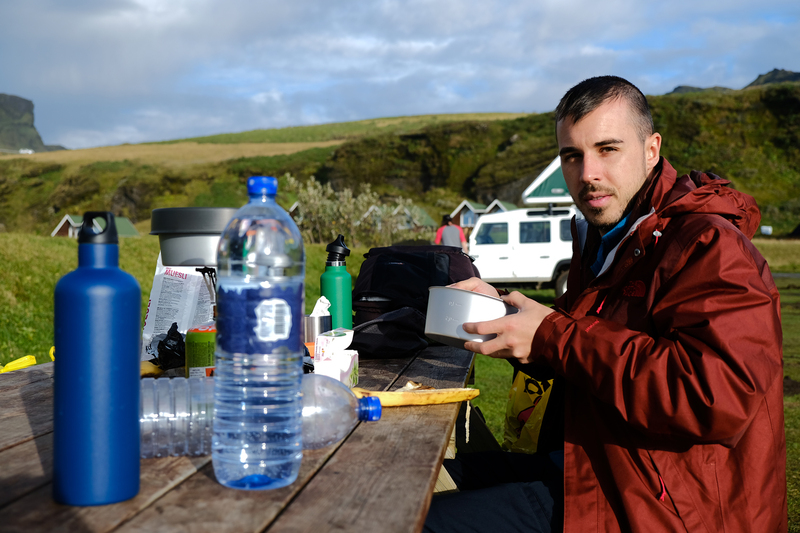 We would start driving down and stopping at the campsites, one by one, until we found one that was to our liking. We had overshot the schedule for the day a tiny bit, and were further delayed by the swimming trunks incident. Our hope of reaching a place to stay before darkness was now dim. It was looking like another late night and dinner by headlamp. As the miles piled onto the Dacia’s odometer, the scenery began to change its appearance for the umpteenth time. This one, however, was something we hadn’t yet encountered. It was ubiquitous, otherworldly and stretched along the road as far as the eye could see. Late or not, we couldn’t resist pulling over to explore what could only be described as a veritable moonscape. Meet the magic green mushrooms: We had no idea what these things were, but had never seen anything like them before. Since we were deprived of data connection (woe of woes) we could not immediately ascertain the status and origin of the strange creations. 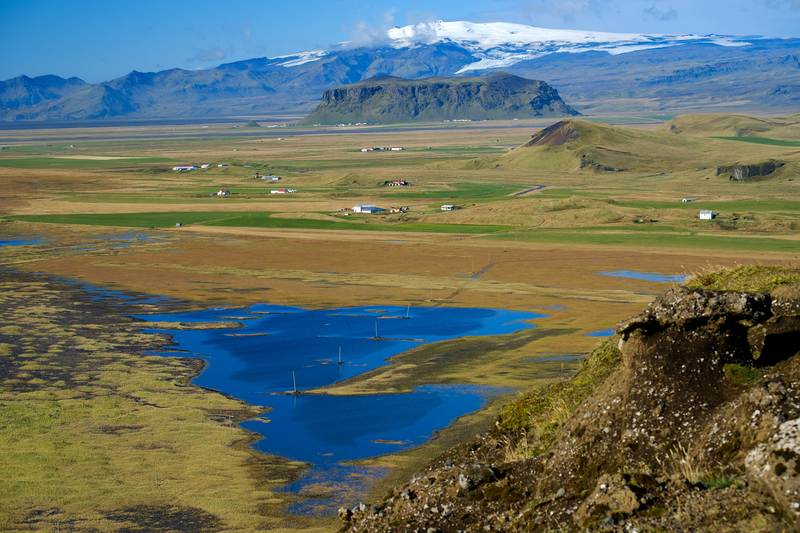 We noted the GPS coordinates, however, and only later was I able to find out this: The Laki fissure and the nearby Grímsvötn volcano erupted in quite the violent manner between June 1783 and February 1784. The result was staggering – 42 billion tons of basalt lava fell upon the island, releasing death clouds of poisonous hydrofluoric acid and sulfur dioxide compounds that left death and destruction in their wake. 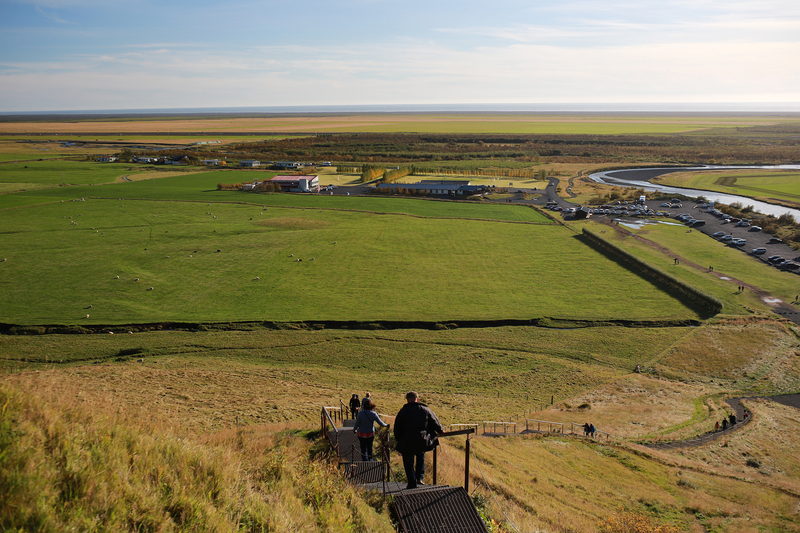 The soil was contaminated, leading to the loss of over half of Iceland’s livestock and the destruction of almost all crops. 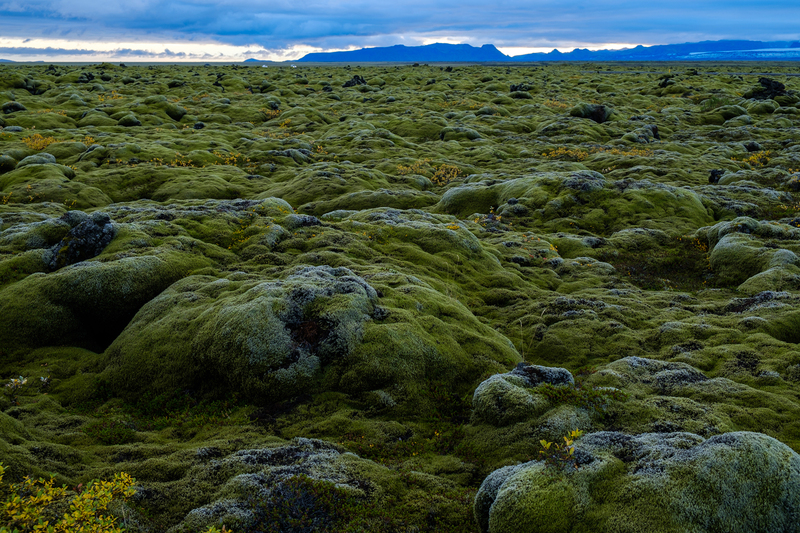 Twenty villages were swallowed up by the lava and a quarter of Iceland’s population perished. Poor news for those living back then translate to excellent opportunity for photographers in the area a few centuries after. 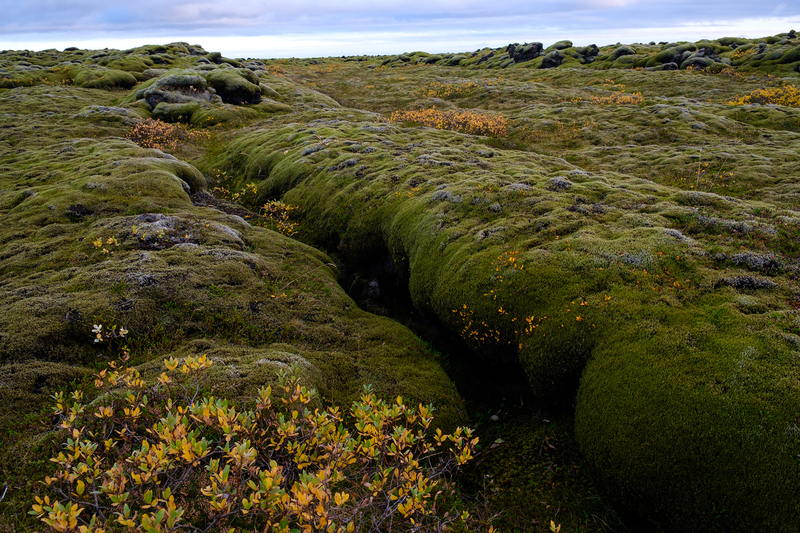 The green, undulating landscape, consisting of rock covered with moss, was apparently based upon the basalt lava that had spread out over the vicinity. 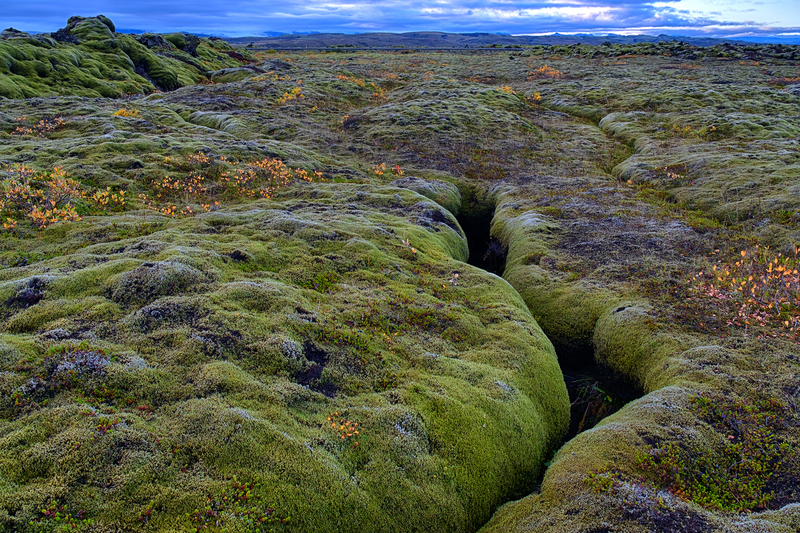 It had become a part of the surrounding nature and fused with moss and plants. Laki was nearby. And we were treading upon its deadly legacy: Of course, once again, even with barely enough light to see, and in the middle of nowhere, the tourists couldn’t resist. They materialized right after we pulled over to an inconspicuous place along the road, hoping to avoid other photographers. This time, the presence of others made for a few cool pictures, though! : And now it wasn’t just getting dark anymore…it was dark. Time to find a place to stay for the night. We were feeling quite tired after another active day, and after a bit of a drive we pulled up at the Skaftafell Campground. The weather had gone sour again, and tiny raindrops were falling with increasing tenacity from the overcast sky. The wind was back. But the campground was dark and the ground was soaked. We could see no structures, with the exception of a small booth for the attendant and this discouraged us. The whole point of sleeping in the car in a campground lot, as opposed to anywhere else where we could park, was to use the facilities that would be provided. 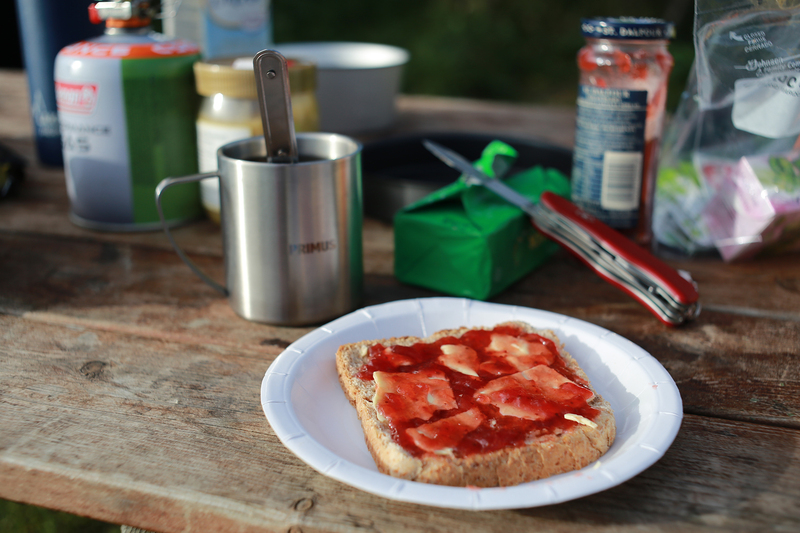 Without any sight of a kitchen area or showers, we decided to move on, even though it was already late, as the Svinafell campground was close by. It was the opposite of the cherry on top of the cake to soon find that it had closed for the season the day prior (!). With our luck and our options slowly dwindling away, we agreed to try an obscure spot on the offline map as a last resort. 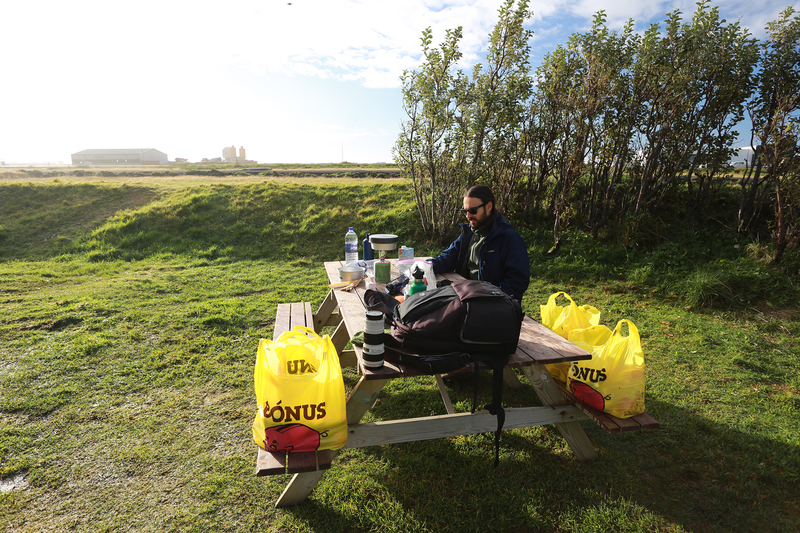 It was marked as a campground, but located on the south side of the ring road, toward the ocean. Of course, the result was bogging down in a private dirt road, with cattle all around and no campground in sight. It looked like we were on our own. 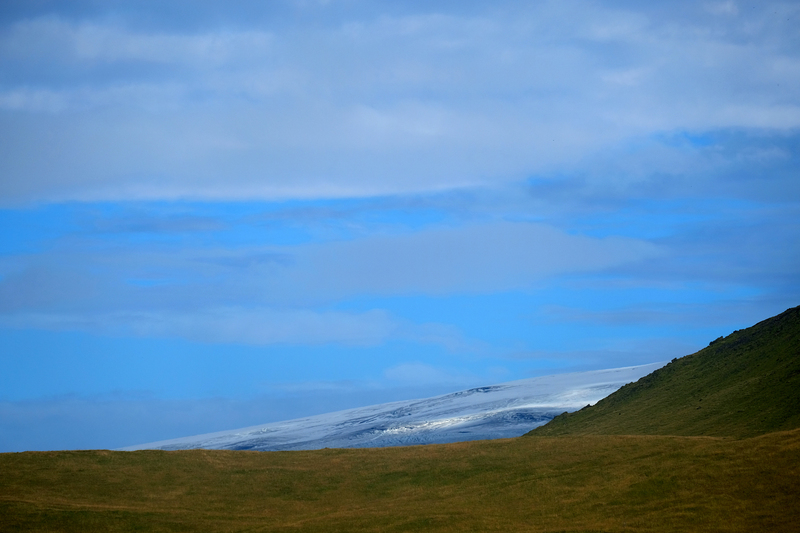 We drove west, heading back where we came from, with the intention of sleeping in the car at the Skaftafell lot, since it was ‘better than nothing’. 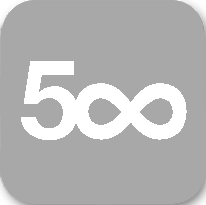 However, while on the way, and with dinnertime quickly passing us by, we decided that we would rather not lose the miles we had already gained. A closed gas station by the side of the road neighbored a large, open field that looked as good as anything we were going to find at Skaftafell at this point in time. A Suzuki Jimny was already parked in the small station lot, signaling to us that we were not the only ones intent on spending the night there. We parked the car in the field, a small distance away from the gas station building and a nearby house. This setup would have to do. The weather, now its previous awful self, had lanced any hopes of dining outdoors. In the darkness and without a table, it couldn’t be done comfortably anyway. We moved the luggage to the front and climbed in the back of the Duster to improvise a dinner. Our trusty bottle of Becherovka (thanks Prague!) would come in handy to combat the rapidly dropping temperatures that night. 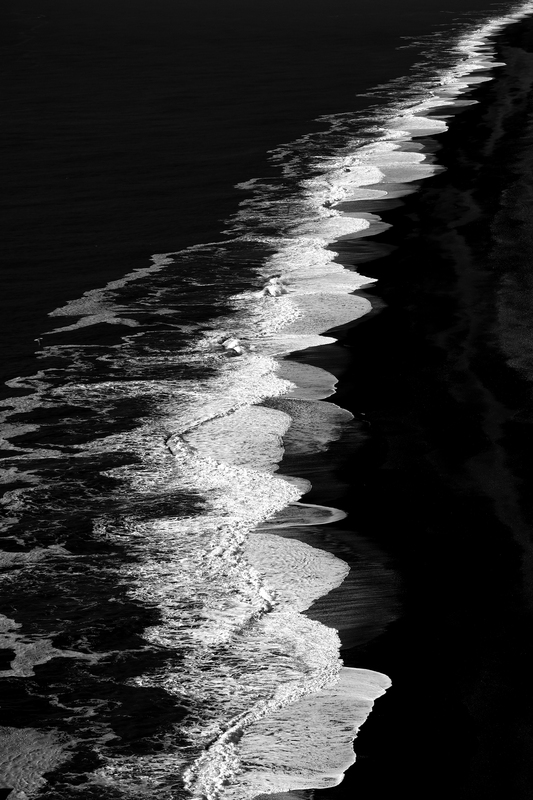 We resigned to dinner and drinks hunched in the Duster, awaiting what we hoped would be a clear next morning – we had plans to photograph a certain iceberg-populated beach at sunrise. Day three was slowly and uneventfully coming to a sleepy end. If only we knew what awaited us a while later, on that cold and dreary night.